There are standards, industry standards – and gold standards. Sibelius 6 is all three. It’s certainly the most comprehensive, robust, easy to use, well-designed, flexible, and satisfying score-writing/notation package available for the Mac (or indeed any platform) currently available. 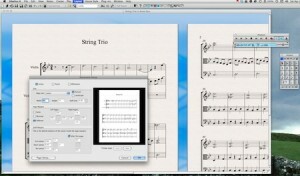 Sibelius 6 has several major enhancements: it’s hard to believe it’s even better. But it is. Sibelius is a music notation package. Although its output is music, it’s neither a sequencer nor a synthesizer nor Digital Audio Workstation (DAW). It’s a package that allows music composition as a score following the conventions of “engraving” music – in much the same way as a word processor allows a novel or play to be written as text. But Sibelius‘ power extends far beyond that of even the most complex and sophisticated DTP software. Avid’s Sibelius 6 has massive and broad “internal musical intelligence”, which – in addition to placing musical events (notes and rests) on the staff or staves – means that it handles the precise and correct placing in and around the bars and staves of every conceivable music object: key and time signatures, instructions for expression, dynamics, system markings, text, comments, rehearsal notes, slurs, stems and ties and so on. Ultimately, you have the final say, though; you can override the automatic and default positioning of most objects where it would make sense to do so. But you are sensibly restricted where it would not make sense… the correct number of beats in a bar for the current time signature, for example. Sibelius thus reflects and furthers your creativity – at the same time it removes the drudgery. Sibelius works with these music objects (notes, rests and so on) using a variety of input methods… via a QWERTY keyboard, using a MIDI controller, by dragging and dropping the symbols onto the staff and so on. The result is a fully-publishable score with parts that conforms 100% to the expected musical and performance conventions. What’s truly remarkable is the extreme ease and transparency with which Sibelius does all of this. The degree of customization that allows you, for example, to tweak and override defaults if you need to is unparalleled. The many different ways to so things that are built into Sibelius could be overwhelming. It isn’t. Above all, there’s the great ease and reliable consistency of it all. 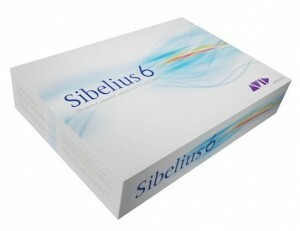 Sibelius 6 has improved on many of these aspects of an earlier very successful application. Sibelius was first written in RISC assembler on the venerable British Acorn computer platform in the late 1980s by twins Ben and Jonathan Finn during their last years at school and time at university. Indeed, one aspect of those origins remains in the current software… the ubiquitous use of the Escape key (a common means to switch modes in early Acorn wordprocessors etc) to exit, nullify, abandon or otherwise “neutralize” a current or intended action, selection or state. That’s typical of the immediacy of Sibelius‘ ease of use. But the product has come a great distance since then; indeed, it’s now a family of products aimed at amateurs, those wanting to trial its basic functions, at professionals and at educators, for example. Not to mention highly-accomplished and prolific professional musicians whose work is internationally known and performed, having been composed exclusively and entirely using Sibelius‘ comprehensive, secure and flexible worlds. For this review the full professional version was exhaustively evaluated. Support and service were found to be near exemplary in every way. Indeed, every aspect of using Sibelius has been ideal. It’s rare that software lives up to every claim made of it. In this case, it truly does. Sibelius‘ compass is large; so this review concentrates on three areas: is its reputation as the definitive application for its purpose accurate, deserved and sustainable? To what extent does this reputation also rest on associated resources? And, first, what’s new in Sibelius 6? In fact the software has come a long way even since version 5. Not that Avid, the company which bought Sibelius in 2006, was dissatisfied with the previous version. But Sibelius 5 was written at a time of other major environmental changes… while Apple was converting from the Power PC to Intel architecture, for example; and when the development environment for Apple coders was changed. What’s more, the need was felt to rewrite the Sibelius playback engine in its entirety. In Sibelius 6 the payoffs are clear. The product not only weathered such changes and upheavals (not least its acquisition by Avid). But its developers also took the opportunity – effectively – to future-proof Sibelius, at least for a generation. It’s is a superb piece of software as a result… flexible, stable, extremely fully-featured, delightfully easy to use, well-documented and supported, and esthetically pleasing. 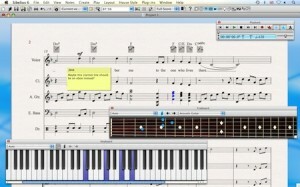 Innovations in Sibelius 6 include “Magnetic Layout”, which automatically and in real time shifts objects (notes, rests, slurs, beams and so on) on the page as you work and add and delete notes etc so that you get a score that not only follows the accepted conventions of music publishing, but also makes your score easier to read. And saves you time: you can concentrate on composing, not nudging. There is a host of aspects of your score that can individually and selectively each benefit from Magnetic Layout’s settings. It’s not a straightjacket, though: most objects so treated can be positioned manually if you ever need them to. It’s now possible to create multiple versions of the same piece of work; distinct versions can be tracked, revised, reverted to and even compared one with another – all in the same file. Sticky Comments can be added to assist in identifying changes and revisions. This, too, worked perfectly during evaluation. As mentioned, playback (the part of Sibelius which perhaps most closely resembles the functionality of a sequencers/DAWs) has been significantly enhanced. In addition to instruments playable via general MIDI, Sibelius Sounds Essentials is a collection of surprisingly good virtual instruments (many licensed from the likes of Garritan (Personal Orchestra, Jazz & Big Band, Concert & Marching Band), Tapspace Virtual Drumline and sounds from Avid’s own AIR Virtual Instruments) which are easily accessible for use during playback – as are those from such sources as the Vienna Symphonic Library and other Kontakt-compatible virtual instruments; though these will need additional setup. Just how good for general purposes the Sibelius Sounds are can be heard in samples from this page. The several Sibelius forums and support groups (Sibelius Forum, sibelius tech support; and the Yahoo Sibelius User’s Group) are frequented by those who know how to help if you get stuck. Bridges to such DAWs as Apple’s Logic 9 are also made easier than before by use of the industry-standard Rewire technology; using ReWire, you can now add and sync tracks in DAWs with Sibelius and produce full multitrack recordings. Remember, though, that Sibelius is first and foremost very sophisticated notation software. To this end Sibelius 6 supports new chord symbols and diagrams, which sponsors the quicker creation and editing of your compositional process. You can now work with on screen keyboards, frets and incorporate recent jazz and other notational advances as well as using new jazz articulations, new slurs, and automatic cautionary accidentals in your score. Pages can be viewed vertically. “Live Tempo” lets you conduct an existing score at playback, tapping a (MIDI) keyboard or pedal device to produce a more nuanced performance, which is saved with the score itself. At the other end of the process, AudioScore Lite (from Neuratron, makers of PhotoScore, see our separate resources survey) allows you to add externally-produced acoustic (or even digitally-recorded medium, like a CD) material into Sibelius properly notated. There are several new plug-ins from Avid/Sibelius. Sibeliusmusic allows composers to share and market their work via a new worldwide sharing site; it currently has almost 100,000 items to find, listen to, download, buy and use. On top of this – as you’d expect with any major new release – there is a myriad of smaller but significant enhancements and fixes, improvements and new functionality. These are often features which further streamline day to day operation. It should be noted that, although Sibelius is not a DAW and has nothing like the range of sophisticated features that does, say, Logic, it can achieve most of what the average musician might want in terms of manipulating sounds. It’s possible, for example, to write MIDI messages in your score… the procedure is pretty simple. Microtonal effects via the pitch bend wheel are an obvious example. Sibelius runs with the pack! The fact that it’s also now possible to write music that synchronizes with video is further evidence of Sibelius‘ deft moves to keep as up to date as possible. These new features would serve only to look good in Avid’s advertising copy if they didn’t make a palpable and significant difference to the way composers, arrangers, conductors and musicians actually work. The more you use Sibelius, the further you get drawn into its highly consistent environment which is geared – feature after feature after feature – towards creativity. Notes outside an instrument’s range turn red; passages of notes (selectable to the note) can be moved up and down using the arrow keys (and by the octave with a modifier key). It’s possible, as suggested earlier, to enter and edit notes in a variety of ways: “live” while playing a MIDI (or your computer’s QWERTY) keyboard; “stepwise” where essentially you can take as long as you like to find and add new notes; and by “pre-loading” the context-sensitive cursor with one of several dozen musical objects (notes, rests etc) and dropping them on the staff. Even the several different ways to select material provide additional flexibility which you’ll come to rely on the more you use them. Changing key- and time-signatures, barlines, tempo markings, indications of dynamics, working with a huge array of textual annotation in the main (European) languages for serious music, respelling accidentals, invoking different articulations merely by adding text in the right place in your score, constraining drags and copies to respect, say, the vertical position on the staff (pitch), switching views and zoom levels the better to concentrate on the music and not the program; familiar OSX gear icons allow you to access a Virtual Instrument Plug-in’s interface directly from all appropriate places (the Mixer, for example) in Sibelius; even navigating multi-stage dialog boxes. All these are achieved easily and in ways that are easy to remember and consistent. There are many keyboard shortcuts. But these are well documented and – again – consistent. Keyboard covers produces an overlay to help. Then take Filters: there’s a whole engine supporting identification, location and acting upon a found set… change all F# quarter notes to A half notes and re-bar as a result; transform all Bass Clef Adagios according to highly specific criteria. Easy and intuitive. It almost goes without saying that transposition can be achieved by the software. Again, hours of work saved. The same goes for the literally hundreds of ways in which almost every conceivable aspect of your score can be adjusted, enriched and made fitter for publication and regular use. The very act of using the software has been extremely well thought-out and finely adjusted. If you suppress certain warnings (“Do not remind me again”-like, for example) and later would rather be able to act on them again, you can reset them all. Indeed, this is true of many other Sibelius actions: you can reset changes to staff positioning, bar arrangement and hiding empty staves which you come to think better of. Similarly, in keeping with its origins, Sibelius 6 is an instrument (no pun intended) for every day use – by players and conductors. For example, it’s possible to add comments in such a way that only one person involved (typically a conductor, or perhaps section leader) sees them. One comes away from a week or two’s use of Sibelius trying and failing to think of anything that could or should have been included, but wasn’t. At the same time, you can be sure that when the next version of the software emerges, its designers will implement what then suddenly seems indispensable. Most actions are undoable – including changes you make to Document Layout, transposition and so on. The essence of having the intricacies of musical notation (which also plays as it is written, and can be written as you play an instrument) work as a highly sophisticated DeskTop Publishing tool does with pixel-perfect placement… including onscreen rulers if you need to override Sibelius‘ very sensible defaults (and lock either). Most things you do operate on what you have selected. That becomes an ever more immediately satisfying way to work the more you use Sibelius. This is software which, for once, deserves the high reputation which it’s built up over the years. By now it really ought to be solid, user-friendly and deliver what it claims to deliver: sophisticated musical scores with minimum fuss and maximum flexibility. It is and it does. And remarkably well. During evaluation, Sibelius 6 was found repeatedly to excel expectations; numerous musical projects were experimented with… the versatility and sophistication of the software in carrying them out was almost staggering at times. Sibelius seems able to anticipate, certainly always dutifully to support, your every move as a musician. The most often-needed keypresses are the simplest and simplest to remember. If you don’t do something often, the chances are that it will be one of those that needs a modifier. Though a single keystroke to take you to the start of your score and play it would be a useful addition. When an operation is destructive (few ever are completely), you’re warned. When an option in an obscure dialog box would benefit from a single, simple line of explanation, there it is on screen! And so on. The most used operations are also in the toolbar at the top of the screen. Management of the floating “Inspectors” (especially, “Keypad”, “Playback” and “Navigator” is easy; their icons – for all the complexity and multiplicity of functions which they need to cover – have been for the most part well designed. The built in help and reference manual work well, are comprehensive and significantly speed up operation as you are learning Sibelius 6; that they’re always available even after you’re more familiar with it is a boon. Indicative of the breadth of Sibelius 6‘s world is the support from third parties. With Sibelius 6 Professional, for example, come the “Lite” versions of two applications from Neuratron, AudioScore and PhotoScore. These are examined separately in this survey on MyMac. PhotoScore Ultimate 6 allows you to convert to Sibelius file format score texts using a flatbed scanner. Sibelius 6 has a large and loyal following. Its members are not the only ones to enhance and extend your use of the software, though, and contribute towards making it as all-embracing as it is. That it’s also possible to sync with video (QuickTime format, for example), use the inbuilt Arrange module to orchestrate and otherwise arrange your ideas, create, print and distribute worksheets for the educational world (almost 1,700 extremely useful assignments, posters and other resources with extra support and examples online: without an adequately-prepared musical youth, there would be no music in generations to come!) are all indications of the reach and breadth of Sibelius‘ appeal. That review looks at the wealth of supporting resources that put Sibelius 6 at the very top of its class.